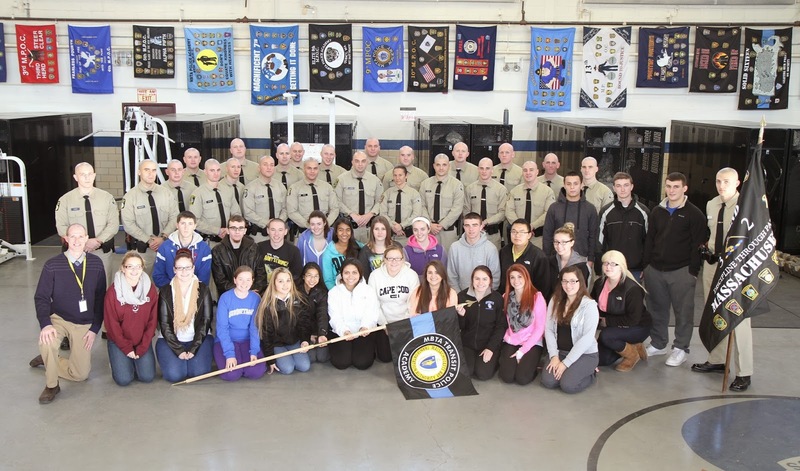 On January 7, 2014 the MBTA Transit Police Academy hosted 25 students from the Quincy High School's Criminal Justice program. QHS Criminal Justice program is the only accredited program (for high schools) in the Commonwealth of Massachusetts. Last year Quincy High School teacher Brendan Welch reached out to the Transit Police with great ideas and visions of forming a partnership which not only benefited the students but also recruits in the academy . In the past the the TPD has participated "career day" at QHS and have had a few students at the academy as role players in previous training projects. On January 7, 2014 however the TPD Academy/QHS raised the bar by conducting scenario based training where the officers had to use strict problem solving skills. There were five different scenarios – house party, emergency room, traffic accident, convenience store and work place. At each scenario the goal was to have officers resolve the problem without having to go “hands on” or make an arrest. The students from Quincy High observed and assisted in training by acting as role players and/or by offering their perspective during the scenario evaluations. It was a successful day and everyone walked away with a better knowledge and understanding. We look forward to a continued partnership and conducting more trainings.